Companies are dealing with the new perplexity to amplify the mobile app presence whether to build an app that gives a better user experience or apps that are faster to develop and run on multiple platforms? A number of times we have been asked this question and our answer varies depending on our client's requirements and their business focus. But most of the time we recommend cross-platform frameworks: most frequently React Native. If you belong to IT industry than you have heard about React Native which is a newest and the most promising way to build cross-platform mobile applications. The conceptualization of developing mobile apps using only one archetype for all platforms sounds interesting. Let's discuss more specifically. Strait-laced - Objective-C, Java and iOS, these are languages that come with a strict syntax which can detect simple errors promptly and make the development process even more satiating for developers. Accessible API- The native environment offers a full access to the needed functionality and APIs. It also updates changes and functionality in a flash without any additional efforts. Extra Opportunities - There are some peculiarities that can be achieved only within the native environment. What are the reasons developers are using React Native? Developer’s community always looking for nimble development cycles and great tools for developing robust mobile applications. Since its components have the counterpart rights, developers can reuse them for building both Android and iOS mobile applications. Originally, React Native was introduced to support iOS, however, with its recent support of the Android OS, developers started using it for creating Android mobile apps with the same UIs. React Native also helps in uploading apps quickly and gives a smoother feel. Another reason developer’s use this framework is that it allows developers to focus on a wide marketplace and making a huge profit. Hence, colossal companies like Facebook, Walmart, UberEATS, and others have shifted their eyeballs towards it. 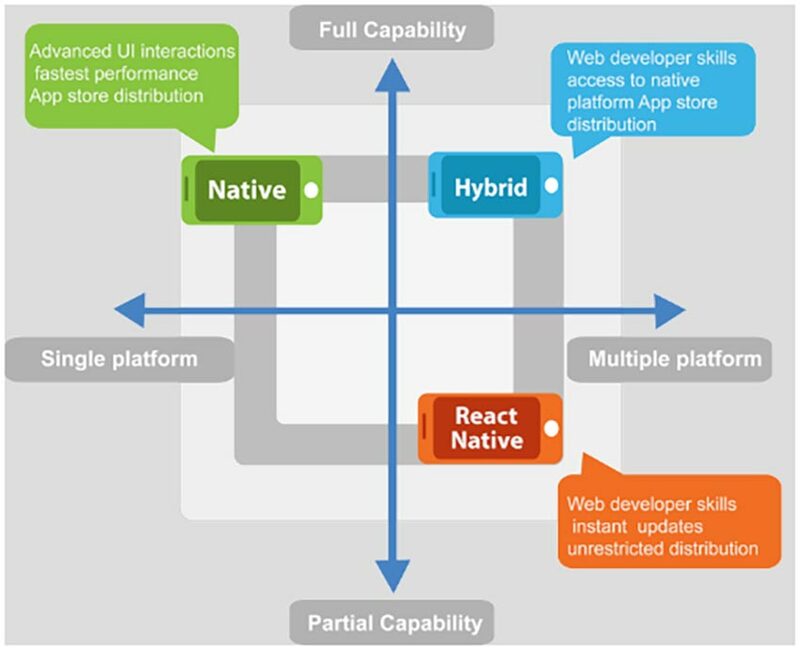 Today, cross-platform applications development has become in high demand, and react native is a perfect fit for a cross-platform development process that offers software ethics that most of the developers demand. With the help of this amazing technology, developers are successfully implementing quality application architecture to boost app security and privacy. REACT Native is also a great choice for those developers who don’t have easy hands on Android specific languages like Java. Cross Platform - As we mentioned earlier, React Native was originally introduced for iOS support, but due to its amazing capabilities and features, Facebook decided to develop its support for Android also. Now developers can build both iOS and Android mobile app through React Native simultaneously through one codebase, which directly cut off the development costs. Performance - React Native use 60 frames/sec and offer the native look and feel to apps. It enables developers to update apps faster with the help of over the air (OTA) updates and once the update get done, you can easily publish the feature. There is no need to update the react native mobile app through the app store manually. Now no need to rely on a Web View for certain functions, React Native allows you to link the plugin with a native module, so you can map up with the functions like zoom, compass, and rotate. React Native framework keep the app running smoothly even in older operating systems. Third party plugin compatibility - No need to rely on Web View for some specific features, React Native allow you to link the plugin with a native module. For example, if you want to add Google Map in your app, you only need to connect the map up with the device’s functions like zoom, rotate, and the compass without occupying a large section of memory and loading faster. All the best with your next mobile app! For a free quote, contact us here.